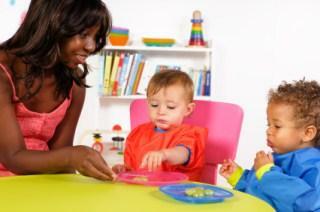 Toddlers are active and notoriously picky eaters. If your child has a tendency to balk at new foods, fruits or vegetables, reading a book together about healthy eating habits is a good way to get them excited about eating right. Short attention spans, difficulty sitting still, and limited vocabularies make having a talk with a toddler about nutrition difficult. Instead, use board books specifically geared towards these youngsters to help you keep your child healthy. Books for toddlers often make difficult or boring topics fun and exciting. Board books are also sturdy and durable, meaning they can handle whatever (and wherever) kids throw them, making them a worthwhile investment. What's In My Garden? A Book of Colors by Cheryl Christian combines learning the names of fruits and vegetables with color recognition. This lift-the-flap book is perfect for helping toddlers interact with you while you read together. I Can Eat a Rainbow by Annabel Karmel helps youngsters learn about fruits and vegetables to make eating them fun. It's Time for Dinner! by DK Publishing comes with reward stickers to use in conjunction with the board book. Eating the Rainbow by Star Bright Books goes through various vegetable and fruits to help children identify them and hopefully try them. Eating the Alphabet: Fruits & Vegetables from A to Z Lap-Sized Board Book by Lois Ehlert includes more unusual vegetables and fruits alongside ones kids are familiar eating. Eat Your Colors! A Puzzle Book (Sesame Street Happy Healthy Monsters) by Sarah Albee features the loveable fuzzy characters from the popular children's program to teach kids about eating healthy. Fruit by Sara Anderson includes bright pictures that are sure to catch the eye of any toddler who can't sit still long enough to hear a long story about healthy eating. Chomp and Chew, to a Healthy You! by Molly Carroll has photographs instead of illustrations to depict good nutrition and eating habits. It's Meal Time by Ron Berry not only teaches kids about eating right, but also table manners. A fun game is also included in this book. While reading fun board books about healthy eating habits for toddlers is a great place to start teaching healthy heating, it is not the same as visiting with a medical or nutrition professional. Children who are not getting proper nutrition can be subject to a host of health problems. Bring your child to a local pediatrician or family doctor if you need additional assistance in getting your child to eat healthy.